The Machine Above All Other Machines? 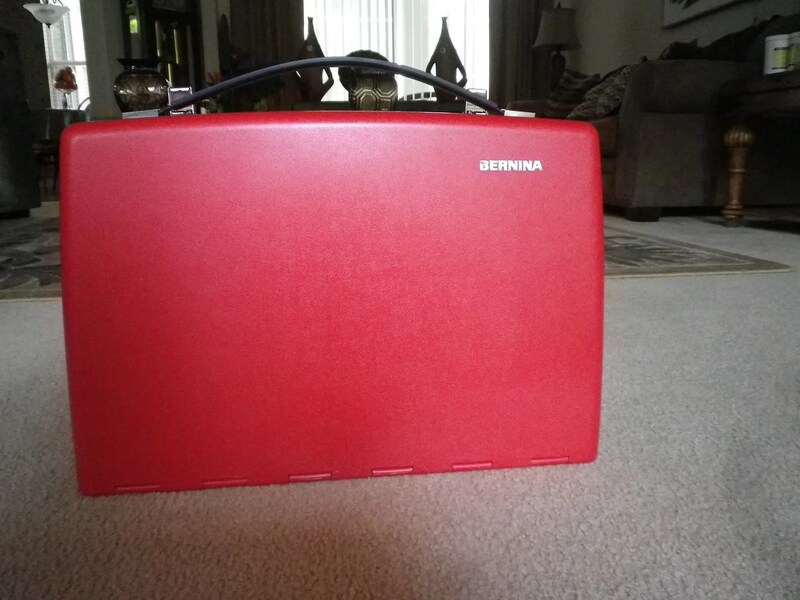 Remember a few weeks ago when I talked about getting a Bernina? Well, folks, it’s happened! Meet my new-to-me Bernina 830 Record. Mechanical. Solid. Mines. Why a new machine when I have three others (Kenmore 1040, Singer 221 Featherweight, Singer 301)? Because I love sewing machines!! And, making Jordan’s jacket last month reminded me I needed a machine with a free arm (had to borrow a blog-reading neighbor’s) and it’s nice to have a heavier full size machine that won’t whine over tough seams. That’s not the fault of my Singer 301. I love that machine. I just needed something stronger. Trena seems to think that if I have a Bernina, my machine collecting will be behind me as I will have ‘the one’. I’m going to go out on a limb here and say that’s just not true 🙂 I do still have my eye on a modern Juki straight stitch (I’m a lover of speed) or a vintage Singer 201. But, I will let the universe bring those to me just as it brought the Bernina 830 in my path. How is that you say? Well, I have to thank blog reader Patti for making it happen. After I posted last month, she emailed to let me know she lived within 30 minutes of my dad in Florida and 15 minutes away from both a Bernina 83 0 and 1230 that were on Craigslist. Not only did she live close, she offered to test sew them for me! And after test sewing, she let me know the 830 was the bees knees and she’d be happy to procure for me if I wanted! Can we have a collective hug for how terrific the sewing community is? And snaps for Patti? I have been on pins and needles to get down here and try it out. And, I do love it. The stitch is beautiful. It’s solid and heavy. The packaging is so well designed. All I have to do now is take out a small personal loan from the bank and start adding to my presser foot collection (1/4, walking, straight stitch, button). Can’t wait to get her home and start working on my next project. And, I can’t wait for Friday! I’m meeting up with other sewists! Trudy of Hot Patterns and Tracy (no blog) and I are doing some fabric shopping in Sarasota. And later on we’ll head to Tamps to meet up with Andrea and Myra. Again, I need more fabric like I need a hole in the head. But, I always need good sewing company and conversation! Next Post Sewing Meet Ups / New Fabric/ HOT PATTERNS!! Congratulations on your new Bernina. It looks awesome. 🙂 Thank you SO MUCH for posting about these Florida sewing bloggers that I previously knew nothing about. I feel like FL is a fashion sewing desert. Now I can stalk….er….subscribe to their blogs. I’ll have to tell you about this place in Sarasota. Apparently, the owner’s brother sends him fabric from New York! Congrats on the new machine! That is the exact same machine that I learned to sew on when I was much younger! Patti is right, it’s the bees knees for sure! I think this 830 and I are literally the same age! You are gonna LOVE this machine! And I understand machine love—I am down to 6, but I used to have 11! Oh, I totally didn’t count my ‘finishing’ machines (blind hemmer, serger, cover stitch). That said, I’ had about another five or so machines pass through my door. I just have a hard time not getting them! What a beauty and it is not all chewed up and marked!!! 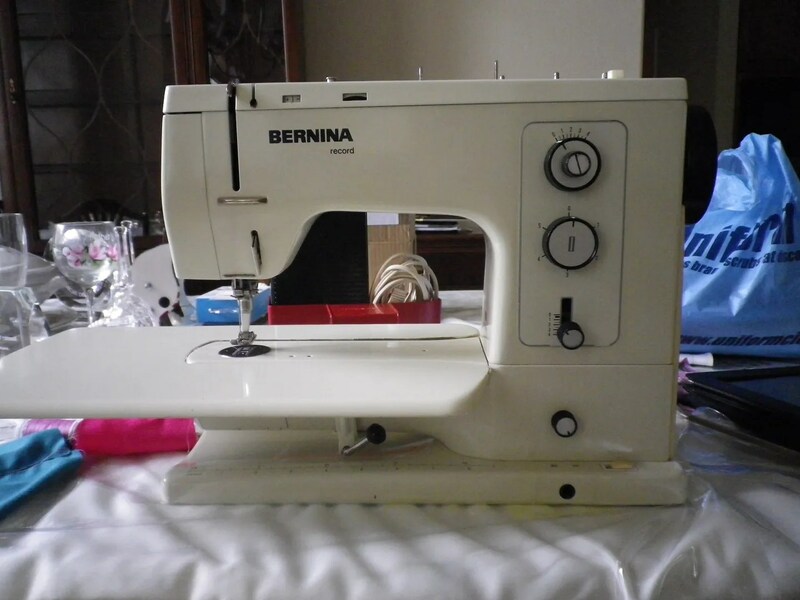 I started with a 930 Bernina in 1976 and it was so responsive…you will have a blast ripping through thick things and difficult fabrics…Woo Who! So glad you have had a great experience. I love my old Bernina. It is identical to yours and it is a work horse. In addition to the presser feet, you might want to consider one of those shank adapters. Nancy’s Notions has a reasonably priced one. Congrats! That was nice of Patti to help you out! How cool is that!!!! Congrats on getting another machine. Great that Patti was on the lookout for this! Congrats! I really like my edge stitching foot. Rarely use the 1/4 foot, think you can hold in that for garment sewing. Walking foot for sure. I only want the 1/4 inch foot for a pocket technique of Kenneth Kings. That said, I still have, you know, three other machines I could do it on! But, I will add edge stitcher to my list! Hurray for Patti! She’s the bees knees. I am a Bernina owner and agree that the presser feet are a $$$ commitment. Since then, I’ve added to my presser feet collection. Oy. Why did I have to see that presser foot case?!?! LOL. I just ordered a drawer foot holder that a guy makes. But, I think I’m going to have to go to Bernina dealership and try to get what you have too! For instance, if the project/technique that month used a binder foot, the binder foot is discounted. You also get special sales each year when all accessories are discounted. With the BC discount, your local dealer’s price will be about the same as an internet/eBay price–only you get dealer support and education. It’s marketing genius–but I also learned sooo much from my dealers, it’s worth it to me. That’s saying a lot b/c I’m a tightwad. Wow, how fun! What a great machine! Are you looking at the Juki TL-2010? I tested one out with Oona and fell in love… I can’t stop thinking about it! Yes, just that kind! There’s a 98Q (the predecessor) on CL in Baltimore now. But, I can’t justify it at this moment. I love straight stitch machines when I am doing long projects like drapes or quilting. One day, it will be mine! They sew beautifully! And quick quick quick. Wow – what an electronic friend experience!! And, you are getting to go shopping with the one and only Trudy Hotpatterns? I…am…well, I am going to be a good person and not describe the hot green slime that is racing around my brain right now out of jealousy of your fabric buying trip. The next time we go to Tampa to visit the DH’s fam, she’s mine (mwa-ha-ha) alll…mine…. You lucky, lucky girl. There ain’t nothing like a good ole metal machines. That thing will purr for years to come. Congratulations! Beautiful! Looks so much like my 930 and SOOO clean. She should give you years of joyful, reliable sewing. What an angel, blog reader Patti is .That’s above and beyond .. so thoughful and generous. I note the machine has the port for the kneelift .. I hope it came with your new baby. It’s the greatest. ugh. i like you so very much. but that’s exceedingly hard right now. congratulations (she said with a grimace, there’s a phrase for it in italian, the rough translation is *i’m so happy for you but it’s like a dagger in my side. *) one of these went up on CL 15 minutes away from my MIL but we were seconds too late! pleaze to post a review for those living vicariously? I love my Bernina 830 Record. It was my happy divorce present to myself in 1979, and I’ve always felt it was the best trade I ever made. There are times I wish it had the “needle down” option (the only big difference between the 830 and 930, I think), but it’s not a big deal to me. I also have my mom’s 1941 Singer Featherweight, so I feel like I lucked out with the two best machines possible. I hope you enjoy your 830, and I’ll be watching for your posts after you start using it. Congratulations! 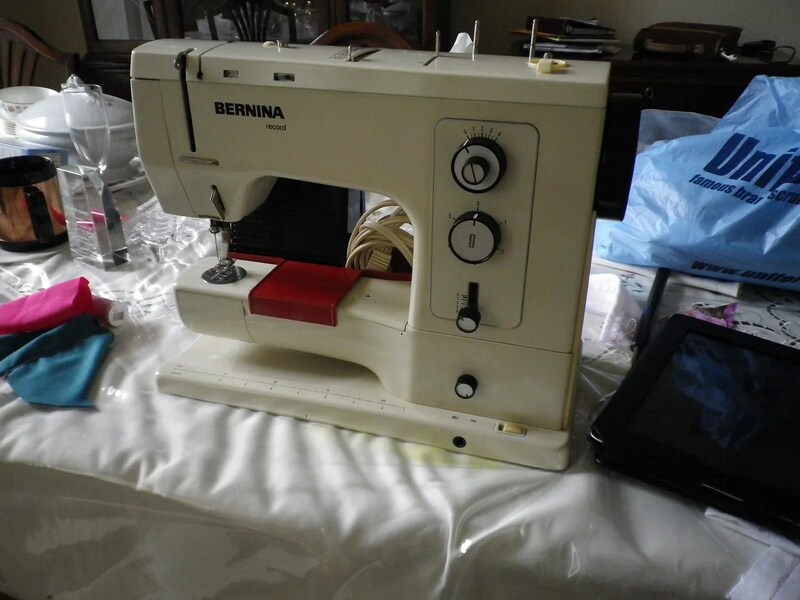 I was lucky enough to receive a 2nd hand Bernina 1000 Designer many years ago, replacing a 1960s Singer (great buttonholes, debilitating tension problems). I’ve always been happy with my Bernina, and I’m sure you’ll love yours even more years from now. I was totally clueless about Bernina feet for so long. The Singer had only had the basics. Since then I also learned that there are more than one style of Bernina feet. My machine, manufactured in the mid 80s or so, takes the ‘old’ style. I’m guessing that an 830 Record would too. But seriously, I feel like the overlocker foot changed my still serger-less life! I’ve had that exact machine since the late 70’s. I got a Janome two years ago and gave my Bernina to my daughter. Big mistake! I missed the Bernina so much that I took it back! My daughter doesn’t sew so it didn’t matter. I love my Bernina. Congrats! I’m sure you will love your Bernina 830. I purchased a Bernina 830 with my first pay cheque almost 40 years ago and the machine is still going strong. I would hate to think how many garments I have made over the years as I sew all my own clothes as well as sewing for my children and grandchildren. I did purchase a new machine a few years ago but ended up giving it away as it wasn’t nearly as good as my Bernina. It seems crazy to say this but I would say this is my most valued possession and like a well loved friend. I’ve noticed a few people on blogs buying mechanical machines. I bought my first machine age 15, a mechanical Elna that is still going to this day. 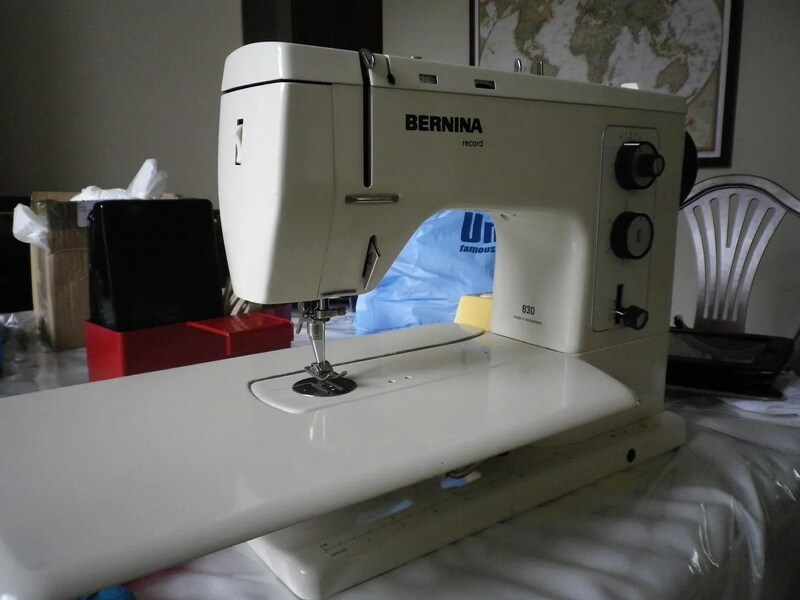 But in the 29 years of sewing since, I longed for a computer machine… I bought a Bernina 240, new, at a price that I felt a bit sick about (we pay more in Australia for everything!). I’m interested in why you went for a mechanical. I’ve had lower end computerized machines in the past. And, my last Kennmore (Janome) was computerized. About the only thing I really really loved about them was the automatic buttonholes. Otherwise, I found them to be pretty light weight. I like a heavier machine as it won’t dance across the table when I’m sewing fast. And, I’ve never had a mechanical machine not work right for me. Both the computerized machines I’ve had have had some kind of glitch that made it not work right. But with mechanical machines I can just keep them oiled and they keep ticking. Out side of that, I’ve always liked vintage stylings in a machine (not necessarily this 70s look). But, I couldn’t quite swallow a new Bernina. And I looked at a computerized vintage Bernina, but I feared if something went wrong with the motherboard, I would going to be out of luck. So, definitely personal preference! Congratulations!! I absolutely love my Bernina and it looks the same as yours!! You will enjoy it!! Super amazeballs! I am in love with the little lever that pops the free arm up and down instead of having to take the damn thing off. I do have to say that being a proud owner of a Singer 201 is pretty awesome. I swear that thing could sew through two layers of carpet if I needed it to. It literally sews at warp speed (I love to sew fast). The stitch is just as pretty as a 221 FW too. I have mine set into an old 401 table and i love the large flat surface it offers. Keep your peepers peeled for a 201! Congrats on the new machine! And have a wonderful time at the meet-ups! 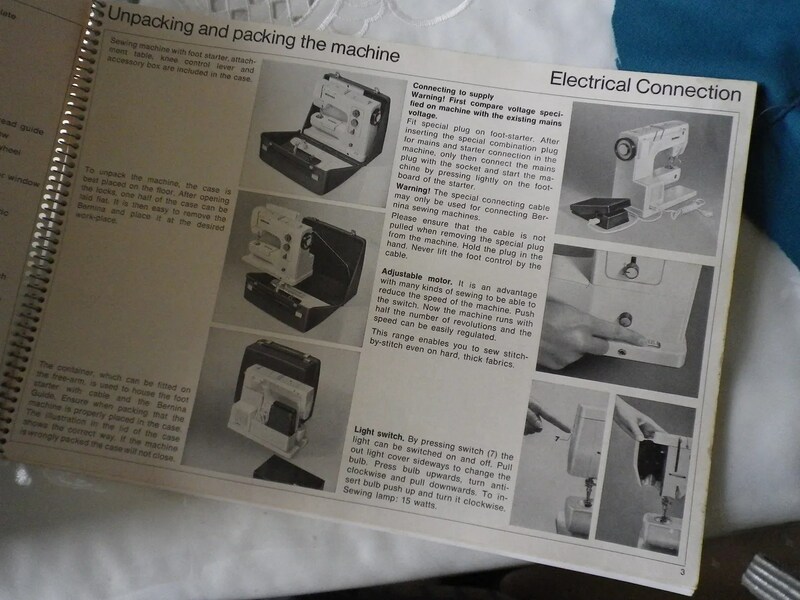 My first serious sewing machine was a Bernina 830 Record. Best machine I ever had. Sold it to a friend. Would take it back in a heartbeat! Congratulations. What a lovely thing to do, Patti you’re truly a star! Enjoy your new-to-you machine! Thanks for sharing. Good thing you had someone to tested for you. I have the 840, eleven feet. I use only one feet most of time. For this machine the feet are not as expensive. Mine is a semi industrial with a large working table. Like you I have other machines. My other favorite is the Juki straith stitch industrial. Too bad I am less skill than most. I have been sewing for 4 years. How is Dad doing? I am sure he was glad to see you. Is he on the internet so he can “see” you more often? I know he was happy to see his baby girl while, even if she was distracted by a new sewing machine. Lucky you, all good things come in time!! I managed to get my 830 record after months of poring over the classifieds, had to my husband to pick it up from a lady living nearly 200 kms away – he was going over that way anyway! I love my 830 and you will too, but I’d still say yes anyday to a modern Pfaff with IDT! Wow, what a great friend to find you that awesome machine and test it for you! I’ll admit I’ve been checking them out on Ebay. I’m eager to hear how it works out. How nice it is to be able to read blogs and learn about the kind things bloggers do for others. Patti sounds like the kind of person we would all like to know. Congratulations on your new machine! 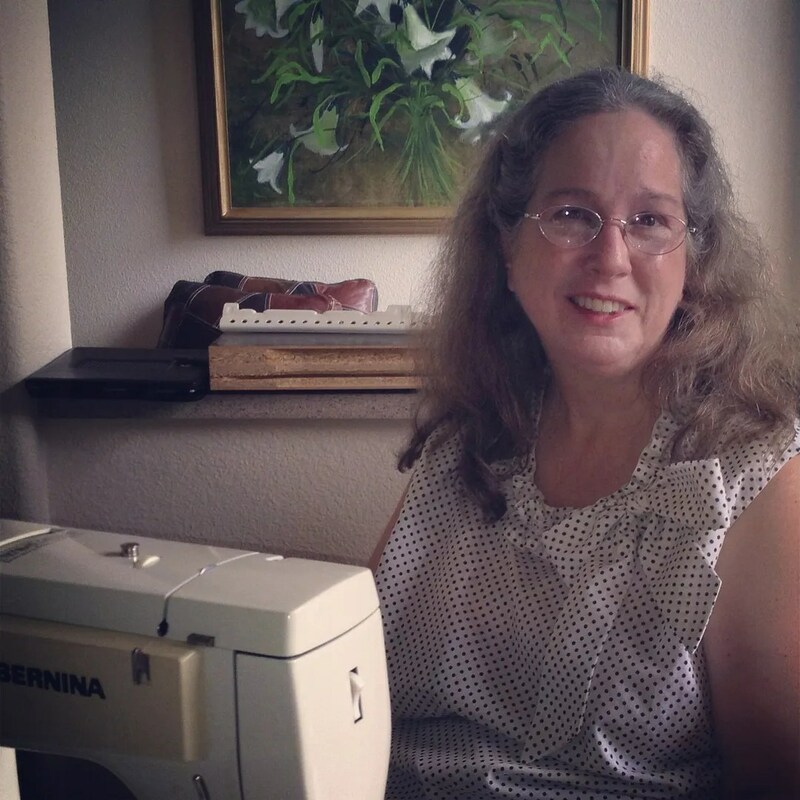 First – big kudos for Patti for helping a fellow sewing enthusiast out! In my defense, I’d been looking for a vintage sewing machine for quite some time… hadn’t settled on any particular brand or model, but when you posted about yours, I checked out its reputation, and the stars aligned when I saw a one in great condition on craiglist for a very nice price… well, I couldn’t help myself! You will love this machine so much! I had exclusively sewn on this growing up, then had to move out and bought some other machine in my youth. When my mom found another 830 for me, I threw that new one away. And a few years ago I got a Brother sewing/embroidery machine, thinking sewing machine technology has improved so much, right? Turns out I only use that Brother for automatic buttonholes and, of course, embroidery. The Bernina sews fast, strong, is perfect ( you won’t need a walking foot, even for knits). I love my edgestitch foot and my invisible zipper foot. The regular zipper foot is way better than many modern zipper feet, too. It is very slim. I am very excited for you!